Tan Delta: Not All Condition Based Monitoring is the Same. Condition based monitoring (CBM) and maintenance programmes typically include many interrelated technologies. CBM provides an assessment of equipment condition, based on collecting and interpreting data with a view to providing maintenance at the optimum point. This allows a company to make cost-effective and logical maintenance decisions, reducing scheduled costs and reducing in-service fault repair costs, by eliminating run-to-failure and the associated consequences of unscheduled downtime. Oil analysis is increasingly recognised as a critical element of condition based monitoring. Oil analysis provides important information about equipment wear-condition, as well as the condition of the oil itself. Keeping machinery operating at the optimal level involves measuring, monitoring and analysing changes in lubricant and fuel oils for contamination and chemical content. This data can provide insights into issues affecting performance and reliability, and operators can make lucrative maintenance decisions based upon these oil analysis results. Common oil analysis practices include outsourcing to an off-site laboratory, with the resulting reports driving maintenance decisions. Alternatively, in-line oil condition sensors have been available for a number of years, however for most early adopters, they have delivered limited benefit due to a lack of sensitivity and temperature instability. 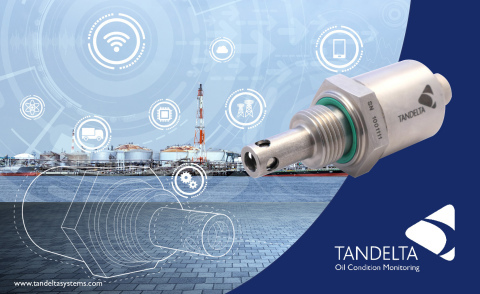 Unlike other oil condition sensors on the market, Tan Delta provides Full Spectrum Holistic (FSH) monitoring of any oil type in any application in real time. The Oil Quality Sensor (OQSx), uses a patented method accurately measuring the electro-chemical properties of the oil at a molecular level. This is achieved by using a very high frequency AC current to measure the ratio between conductance and capacitance of the oil, giving an extremely high level of sensitivity to all common oil wear mechanisms and contaminations with exceptional temperature stability and repeatability. The sensor is configured with the electro-chemical fingerprint for the required oil, as the oil changes the electro-chemical fingerprint of the oil also changes and these minute differences are detected by the OQSx. Repeated independent testing has established the point at which this increased molecular activity will have a detrimental effect on the oil’s ability to function correctly. This gives the OQSx the ability to monitor an oil through its whole lifecycle, giving an accurate oil condition reading by constantly measuring the difference between the clean and current oil. This generates a simple traffic light output with an associated Tan Delta Number, allowing very accurate trending of oil condition over time. This unrivalled FSH technology in the condition monitoring industry, defines why our products are adopted by world leading companies. Patented techniques, developed and refined over many years, ensures ultimate performance with absolute reporting accuracy. Tan Delta continually invest in the development of new technologies and products which will deliver even greater commercial benefits and opportunities for our customers in the future. Tan Delta Systems is the global leader in oil condition monitoring technologies and systems that reduce equipment operating costs. FSH oil condition monitoring products are used by leading equipment operators around the world to reduce costs and increase profits. Distributor enquiries welcome.